Astha Ummat is the I-House Green Fellow for 2017-2018. She’s a second year graduate student pursuing a master’s degree in public administration at Columbia University’s School of International and Public Affairs (SIPA). 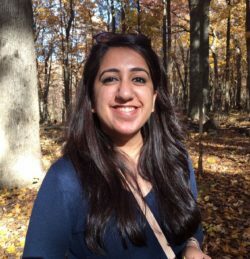 Astha focuses on energy and resource management and came to SIPA with an undergraduate degree in Mathematics and a postgraduate degree in environmental and resource economics. She is on the board of two student organizations: the SIPA Energy Association and the SIPA Environmental Coalition. From 2013-2016, Astha worked on energy and climate change policy as a consultant at the Apex Policy and Planning body of the Indian federal government. Astha and her team reduced the energy bill of their building by ~15%, a success that led to a policy decision making all public buildings in India more energy efficient. What made you want to apply to I-House’s Green Fellowship? When I read about this fellowship, I thought it was the perfect opportunity to collate all my skills and experience and use it to contribute my two cents toward helping make I-House a greener space while conserving our financial resources. What are your plans for the fellowship this semester? My fellowship started in November 2017 under the supervision of Vincent Melito, Director of Facilities and Site Operations at I-House. And I couldn’t have asked for a better person to work with! Mr. Melito is really supportive of all ideas that I bring to the table. He has a lot of interest in this space as well, a wealth of experience in this field, and so many great ideas too. The experience so far has involved gathering ideas, gauging the practicality and the business case behind potential projects and making connections which would help us map out our course of action for 2018. As many previous and returning Residents might remember, I-House rooms underwent a change in lighting technologies last year. One of the projects I’m working on is a utility expense analysis to communicate the effectiveness of this change. So much is being done to improve I-House, so if we understand the “why” and the “how” along with the impact that each one of us can make individually we’d be better informed and actively willing to help bring about change. I’m going to be doing a similar exercise for our water use, as well. We’re also looking to make I-House a Green Certified building by working toward acquiring the Leadership in Energy and Environmental Design rating of the US Green Buildings Council. This involves doing a lot of background data work, research, building baselines and analysis to work toward becoming a green building. Another project is exploring the feasibility of rainwater harvesting on the I-House roof. Rainwater would be a sustainable way to wash the pathways and water the plants surrounding I-House. NYC has some fantastic rebate and incentive programs which we’re hoping to leverage to carry out these tasks. What is your plan for the next year of your fellowship? There are very interesting times ahead! Till May 2018 (when I graduate) I hope to build a solid foundation for those with a longer term timeline. Increasing Resident engagement: I am so excited to be a part of a Resident body which is so inspiring and full of ideas! I have met so many Residents who are thrilled to be involved in different aspects of making I-House a greener place to live in. I want to leverage all the expertise, enthusiasm and ideas we all bring to the table.I plan to kick off the next semester with a “Green Social.” It’ll have a recycling game, locally sourced food and surprise goodies! This would be a great platform to share the work I’ve been doing and gain ideas from fellow Residents. I also plan to organize some round table discussions for people to talk about themes relating to the ever-evolving sustainability space. Analyzing our energy and water use and identifying high impact cost and energy saving opportunities through an energy audit in I-House. Launching an I-House Composting Program: Another very interesting project that is in the works is coordinating with the NYC Department of Sanitation to bring composting to I-House. This will help us handle our food waste in a more sustainable fashion. Shifting away from Less Sustainable Products: I strongly believe in building a business case showing users that a transition away from these products would be beneficial, and that’s something that I will be assisting the Facilities and Site Operations team in doing. What are your goals for the future after I-House? Resident Mehemed Bougsea has already built an impressive resume in launching and supporting innovative social enterprises.